When our kids were growing up nearly all of our family vacations involved camping in one form or another. We took our first family camping trip when our son was just 3 month’s old to Lake Mary near Mammoth Lake, California. We had a new Volkswagen Van and, although it wasn’t a camper model, it did have a rear seat that folded out into a large bed that had plenty of room for the three of us to sleep. When our daughter was born 2 years later, it was starting to get a bit tight overnight in the back of the VW. It wasn’t long after that that we started to consider other camping options for our growing family. 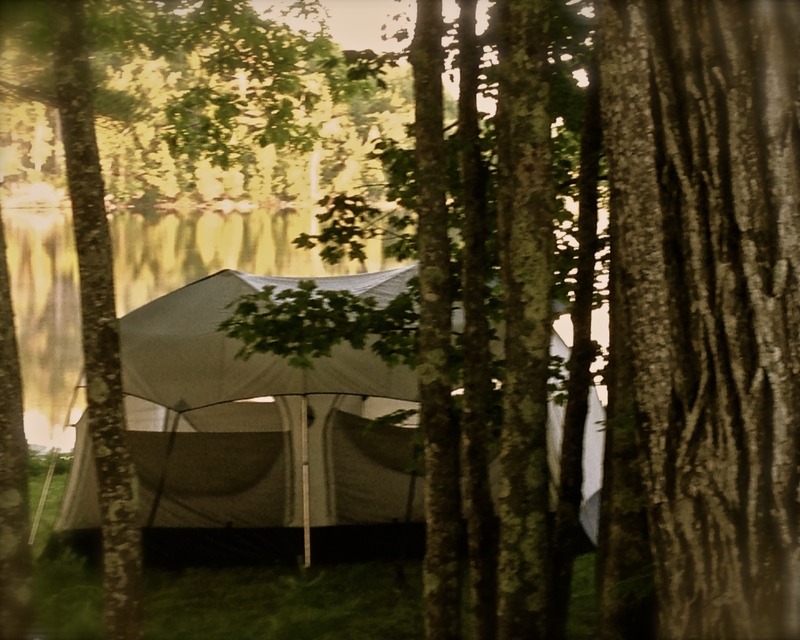 Enter the Northwoods Lodge tent. We discovered the Northwoods Lodge at our local Sears Store. It seemed like the perfect solution for our growing family. It was large, probably 10’x14′, with two separate rooms, a rain fly and sun awning. So in the summer of 1989 we loaded up the kids and headed to Big Sur for our inaugural adventure in the new tent. In spite of our daughter coming down with the flu almost immediately upon pitching the tent for the first time, it was a good trip overall with three weeks of camping along California’s beautiful central coast. The kids had lots of space to spread out, and my husband and I had a bit of privacy thanks to the thin nylon wall separating the two “rooms”. We downsized considerably when we moved to Maine 7 years ago. But somehow we found the space in the rental truck for this massive tent. Maybe because it was practically new, maybe because we thought the kids might want it for their own families someday, or maybe just because of the good memories we had from the few trips we took in it. How can you forget the one to Hume Lake where our Shepard mix, Zeke, tore out the screen door to chase off a bear with my husband in close pursuit wielding a canoe paddle? Anyway I was talking to my neighbors yesterday who have a son and a daughter about the same age as ours were when we started tent camping. They mentioned that they were in the market for a family tent and I immediately thought of the North Woods Lodge. Long story short, we offered to give them our tent if they wanted it. We pulled it out of the garage and Don helped them set it up on their lawn. It is still there this morning and I think it has found a new home and family. New memories just waiting to be made in the old Northwoods Lodge. This entry was tagged earthquakes, family camping, family memories, Northwoods Lodge, tent camping. Bookmark the permalink.